I hope you’ll all forgive a not very Christmasy posting this month from me. It is about gifts though, how they are passed on generation to generation and the stories they carry, so I hope that’s close enough. My mother was sorting out her jewellery recently and came across this moonstone necklace. Mum kindly passed it on to me and it’s been making me look a great deal more classy than usual at various parties this season. Mum was sent it by her Aunt, Hope Wicksteed, in 1991 after thieves had stolen most of her jewelry and Hope thought the necklace might be some comfort. Hope was a poet, and secretary to Compton MacKenzie among many other things during her life. She was also, thank goodness, a great chronicler of family stories. She wrote a letter to go with the necklace explaining that its story started in Japan with Hope’s Aunt Jessie who lived in Tokyo for some years. She met a Somerset man out there and married, but went to Japan as a single woman to teach English before women could even vote in this country. Hope was born in 1908. Reading that letter reminded me of other family treasures that must have made their way here in those parcels. One I remember vividly from childhood is a copy of a folk story ‘The Old Woman who Lost her Dumplings’. I used to spend ages looking at the beautiful woodcut illustrations while Gran was looking after me. The book was printed on crepe paper which felt like cloth, and though you can’t have the feel of reading it, you can see all the text and illustrations here. Mum says that certainly was a present from Aunt Jessie and was sent to my grandfather, Hope’s brother, when he was young enough to enjoy such things. Now I’ve started to wonder about these figures which found a home with me after my grandmother moved into sheltered housing. The house / watch tower like thing has ‘Wyeda’ stamped on the base, and there is a stamp on the base of the cheery ivory fellow too. If there are any scholars of such things out there, do let me know. Whether I’m right or wrong about where these things came from, I’m very glad I have them and the necklace. They make me think of the people who made them, who picked out the stones from the river bed, and of Jessie Slater shopping for trinkets to entertain her nephew and niece while they were growing up in those uncertain times on the other side of the world. Sometimes when we give people presents we give them stories and histories too and those can become as important as the objects themselves, perhaps that’s worth remembering when you are looking for last minute gifts! 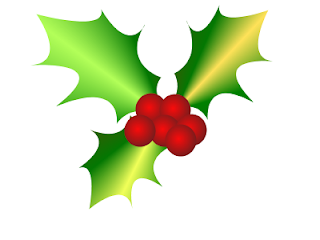 Now back to the festival season with my very best wishes to all the History Girls and our readers for a Merry Christmas and a prosperous New Year. I am GREEN WITH ENVY at that necklace. 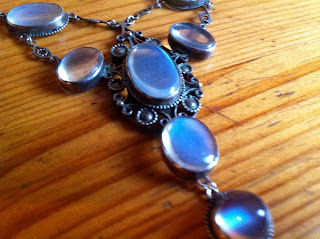 Positively my favourite stones of all are moonstones. And it's wonderful what stories lie behind the gifts. Lovely post. What a beautiful necklace and what a beautiful story behind it! You are absolutely right that the best presents come with stories. A ring I inherited from my mother, from her mother, from her mother came with a story (which may, or may not, be true) about it coming from the Klondike Gold Rush, and I love it with a passion! Lovely post! I recall a time when tv was urging everyone to clear out clutter and I kept wondering what stories were being thrown away for fashion's sake - and every time the craze comes again. I will study that delicious dumpling story. I often tell a version of that tale though I'm not sure where I picked it up. But, oddly, though I give it a Japanese context, in my head I imagine the old woman's laughing face as that of a dear, kind long-gone Geordie aunt-in-law who was always able to make the best of things. Two stories in one. A delicious post which I've just come to late. Those moonstones are too beautiful and don't you just love that throwaway line in the letter... 'they pick them up off the river-beds.' Oddly enough before I read your post, I commented on Essie Fox's post today 24th... on how easily we throw away 'treasures'. Wonderful that this necklace has survived and I love the concept of being able to smell a parcel from Japan. I always felt that about arriving in Hong Kong. Even If I closed my eyes I would know where I was.